AXIOM is a Chicago based Healthcare Consulting Company that provides ambulatory/outpatient (ASC’s, ambulatory health clinics Office-based Surgery) accreditation, licensure and certifications throughout the United States and Latin America. Our practice has been in business for over 20 years and is based on the philosophy that a close client relationship is vital to the success of our clients and the services we provide. AXIOM will work closely with you and your staff to develop a mutual understanding of your objectives and plan a dynamic strategy to achieve your specific goals. Whether that be accreditation, licensure, certification, or maintenance of your existing accreditation, licensure & certification programs. Contact us today to learn how Axiom can get your facility accredited, licensed or certified. 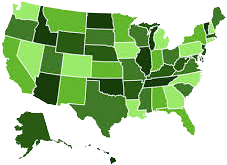 What state are you needing consulting in?